I don’t have the energy or time to write the summary of how I feel about the election, except to note that others have already done a pretty good job of summarizing for me. The red states are states in which Obama did worse than Kerry. The red states are the states where Obama did worse than Kerry. That’s a pretty good illustration of the heart of social conservatism in the US. That aforementioned thread suggests that there was some interesting gamesmanship going on in the end to bring the McCain campaign so deep into Pennsylvania, a state that it ultimately lost by a double digit margin. Interesting that even after a blowout, there’s pressure from the media saying Obama needs to move to the center. Both McCain and Obama’s campaign systems were hacked and compromised, and Palin took runaround money meant to buy three suits for the convention and bought enormous quantities of clothes for her family and herself, including some items that have apparently been lost. Threats to Obama, as monitored by the Secret Service, were directly correlated to Palin’s feral rallies. I don’t know if Erik‘s seen this, but I found this report on Talking Points Memo interesting. Apparently Intrade’s internal investigation confirms that someone is artificially inflating the value of McCain (that is, the probability that he’ll win in November) by dumping huge amounts of money into the market in an irrational fashion. The CQ article says that it’s a single “institutional” member of Intrade and that they’ve been in contact with the investor, but that there’s no evidence that the rules of the exchange were violated. Intrade is small enough to be manipulated, if you have a little spare change, and therefore its predictions aren’t trustworthy. Double-check any important prodictions with the Iowa Electronic Market and Betfair. There are McCain supporters out there who are willing to spend, and lose, large amounts of money to influence an outlying marker of the campaign’s success. What are they betting on? The persistent difference in value can be explained by one of two market frictions: either there are one or more irrational actors who are making trades based on something other than rational economic decisions, or there is information asymmetry: the trader knows something that we don’t about the outcome of the election. I’m inclined to think it’s the former. But I don’t rule out the latter, for the reason that the GOP and its followers are starting to scare the hell out of me (anyone else wonder why someone shouting “Kill him” at a GOP rally wasn’t immediately brought in for questioning by the Secret Service?). It’s not hard to see why the GOP might be frustrated at this point. The Democrats have done a superb job of keeping their powder dry, waiting until McCain really stepped up the smears to point out that he has deep roots in banking and real estate corruption through his membership in the Keating Five. This campaign has refused to roll over and play dead while smears and attacks were directed at them, and while they’ve played hard in return, it’s been to point out how McCain and Palin have specific unsuitabilities to deal with the issues in front of the country right now. The downside of this campaign–one of the few really well contested matches we’ve seen in recent years–is that it doesn’t leave much room for discourse on the issues. I’d love to see Obama clear enough of the smoke to start talking about how we get out of this mess, but I think he’s going to be facing enough crap for the next few weeks that we won’t hear substantive proposals for a while. Author Tim JarrettPosted on October 7, 2008 Categories AmericaTags election, markets, mccain, obama1 Comment on What are they betting on? …because something tells me this race is going to be a rollercoaster for the next few weeks. 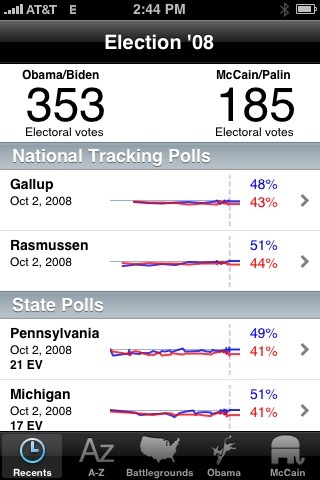 Screenshot below from the excellent Election ’08 iPhone App, from Pollster.com and Slate. For a more nuanced view, look to the fine folks at Electoral-Vote.com, which shows Obama’s lead 338 to 185 electoral votes, with 15 ties. This high margin is pretty new in the race–back in early September, the lead was only about 100 electoral votes. For more context, check out the historical trends on Electoral-Vote.com, where you can see what happens if you don’t count the states with a less than 5% margin of victory (answer: we don’t have a clear winner yet). In an interview filmed the afternoon of Sept. 3 and posted on the Web site LinkTV.org, Schwartz was candid about how he envisioned change under a McCain presidency. “Less taxes and more war,” he said, smiling. He said the U.S. should “bomb the hell” out of Iran because the country threatens Israel. Asked by the interviewer how America would pay for a military confrontation with Iran, he said the U.S. should take the country’s resources. A few hours after the interview, an unknown woman helped herself to Schwartz’s resources. So far, John McCain’s nomination of Sarah Palin on the basis of a 15 minute interview is proving to be the best illustration of why you should carefully vet vice presidential candidates–particularly those who haven’t run for national office before. Desperate: This has the appearance of an appointment made in haste. It’s been established that Joe Lieberman, McCain’s first choice, was not acceptable to the Republican base, and it appears that Palin was picked very late in the game. All the indications are that Palin’s vetting was shallow; indeed, Talking Points Memo indicates that the Republican team has just now hit the ground in Alaska to do the deep digging. And certainly the ongoing information suggesting that Palin used her office to try to force the firing of her sister’s ex-husband, and that she did fire his boss when she couldn’t get the ex-brother-in-law fired, suggests that McCain’s team was not aware of this abuse of power on Palin’s part. As does the unfortunate situation with her daughter. As do her misleading statements about her support for the Bridge to Nowhere (brief: she supported it before she condemned it). As does her apparent past membership in the Alaska Independence Party. 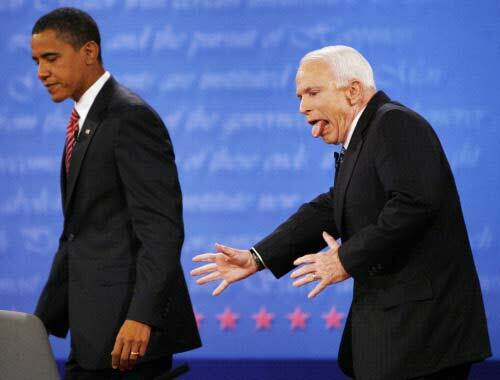 Brilliant: McCain needed to differentiate himself from Obama while seizing hold of the “change” meme to pick up independent voters, but he also had to play to his base, who were late to fall in line behind the one-time “maverick.” Picking Palin on the basis of who she was (conservative, anti-choice, pro-guns, a short history as a reformer) helped shore up the base. But more than this, maybe there’s a new calculus in play, a short-term thought process that says that the American people are going to be more likely to think whether a candidate for the second highest office in the land is “like them” than they are to worry about the person’s fitness for the job. In this short-term way of thinking, someone can be good to vote for simply because they are empathetic, because the voter wants to be that person. It’s kind of a “politician as celebrity” play. Whether the choice, which looks to me like pandering, will work is still at play. Gallup and Rasmussen both show Obama widening his lead over McCain after the pick, primarily by picking up undecided voters. But polls have been wrong before. See also: Why Palin should be taken seriously (Scripting News). Update: Illuminating in light of the above: McCain campaign manager Rick Davis says “This election is not about issues. This election is about a composite view of what people take away from these candidates.” So in other words, the McCain camp is betting on the celebrity view of politics that I describe above. Which is ironic, given their ads bashing Obama for being a celebrity.